Applying knowledge from one discipline to another is an oft-cited goal for undergraduate students. However, in many universities, science courses are taught essentially in isolation and do not provide adequate opportunities for students to connect their knowledge across disciplines. 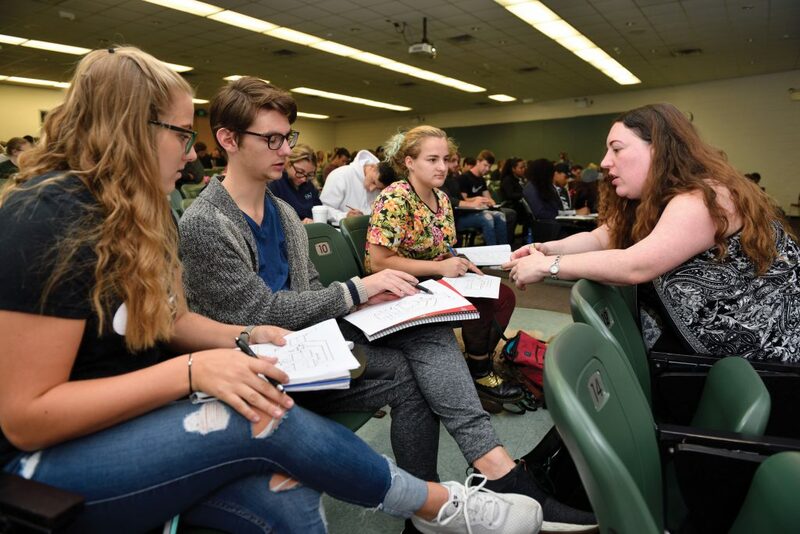 Drs Rebecca Matz, Sonia Underwood, and Kristin Parent, along with their collaborative research team at Michigan State University (MSU) and Florida International University (FIU), are developing activities that help address this gap. The approach to teaching science courses in universities is often to compartmentalise disciplines from one another. If a student chooses to enrol in a chemistry degree program, they are immersed in the world of molecular structures, reactions and laboratory experiments. Likewise, a biology student will study evolution, cell structure and molecular biology. 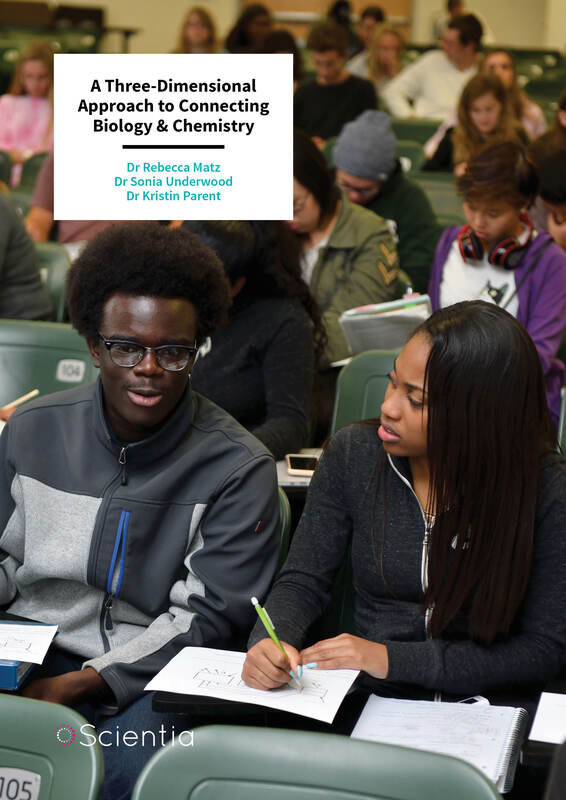 Though some broad foundational courses are required (e.g., a biology student will enrol in general chemistry), rarely will students make explicit connections to another discipline within a given course. Therefore, when a student commits to a particular degree program, they may encounter few opportunities to connect their knowledge across disciplines before graduation. Such compartmentalisation fails to reflect the reality that addressing important scientific challenges requires drawing on knowledge from multiple areas of science (and other fields as well). This poses a dilemma to students – how do they acquire and practise using such knowledge? As science and technology continue to advance in complexity, it is becoming recognised that a multidisciplinary approach is useful for science learning. Novel discoveries as well as a deep understanding of the fundamentals in biology increasingly require connections with other areas in science. Drs Rebecca Matz, Sonia Underwood, and Kristin Parent, along with their team at MSU and FIU, together share a wealth of expertise in chemistry, biology and science education research. Their two-year National Science Foundation-funded project, ‘Creating Assessments for Student Understanding of Core Chemistry Ideas in Introductory Biology’ aims to develop activities that assess undergraduate students’ abilities to make such connections. The research team aims to develop these activities aligned with a ‘three-dimensional’ strategy. Developed by The National Research Council (NRC), the Framework for three-dimensional learning rests on a view of science that ‘continually extends, refines and revises knowledge’. The three dimensions consist of: (1) scientific practices, that is, what we want students to do with their knowledge (e.g., build an argument from evidence); (2) crosscutting concepts, that is, lenses for understanding problems that are useful across disciplines (e.g., systems thinking); and (3) core ideas, that is, ideas that are both central to a discipline and generative of new ideas (e.g., evolution in biology). The aim of the Framework is to support the development of a future generation of proficient citizens and scientists who are able to draw on knowledge from multiple areas to address modern scientific challenges. ‘In the project, we are designing activities (appropriate for both group and individual work) that ask students to use their knowledge of chemistry to explain a biological phenomenon,’ says Dr Matz. To achieve the project objectives, the team is carrying out a research plan that consists of several tasks. The first task entailed developing and implementing a survey for instructors about which areas of connection between chemistry and biology they most valued in their local context. By matching the areas of interest with the instructors’ views, the team aimed to ensure that the assessments would be valid and therefore more likely to be relevant for distribution on a wider scale. The research team then used the results of the survey to prioritise the areas of connection for developing the activities. Following a simplified method of evidence-centred assessment design, the team determined the goal of each activity as well as the responses students would provide as evidence of their connecting the core chemistry idea with the biological phenomenon. The team designed each activity to incorporate a scientific practice, crosscutting concept and core chemistry idea, and used an instrument called the Three-Dimensional Learning Assessment Protocol (3D-LAP) to verify that the activities reflected each dimension. Each activity is situated within a biological phenomenon. 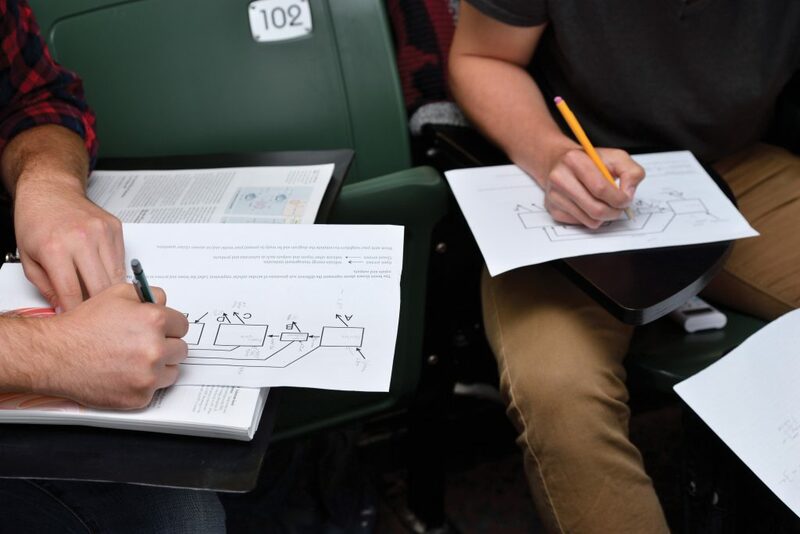 For example, one activity asks students to explain the connection between the role of energy in the formation and breaking of covalent bonds and a molecular motor that effectively packages DNA into a virus particle using ATP. Students are prompted to recognise that the energy released from ATP hydrolysis must be physically proximate to the virus particle and DNA in order to power the molecular motor. 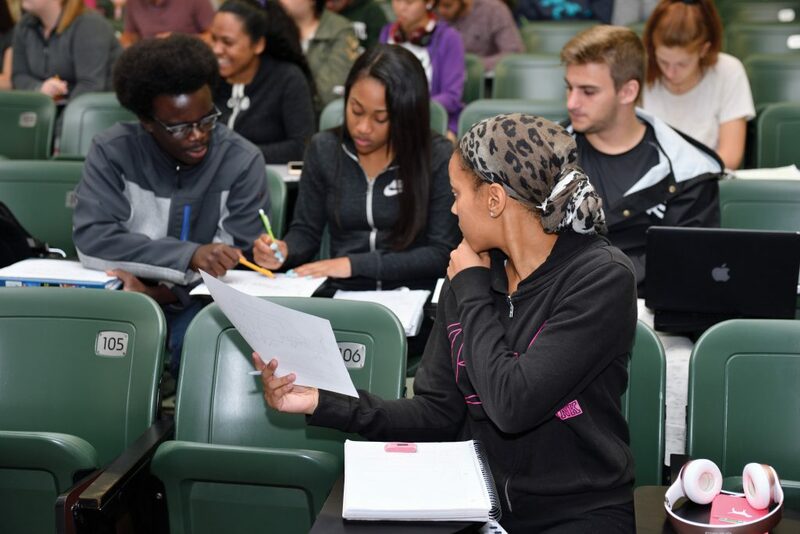 Each of the activities has been distributed in various ways to students in general chemistry and introductory biology courses at both MSU and FIU. Following pilot administrations and revisions for clarity, the team administered the activities to various populations of students at each institution, collecting approximately 800 student responses in total. Follow-up interviews helped the team to investigate the face validity of the activities, identifying what students were thinking about as they completed parts of the activity and points of confusion. The team’s preliminary analyses indicate a range of responses showing that some students are able to connect across the chemistry and biology concepts, while others continue to demonstrate compartmentalised knowledge; prior course-taking patterns are an important variable to consider in interpreting the student responses. 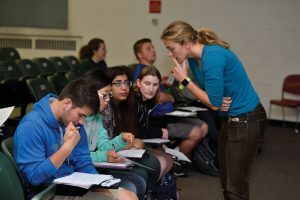 Regardless, students often mentioned to instructors that the activities helped them make connections that were otherwise never explicitly highlighted for them. Collecting feedback from instructors, an external evaluator, and a project advisory board is also ongoing. The research team has endeavoured to share the results of their work with an array of audiences, including the Society for the Advancement of Biology Education Research (SABER), the American Chemical Society (ACS), and the National Association for Research in Science Teaching (NARST). Each audience brings a mix of practitioners and researchers who might benefit from seeing how students are making connections between chemistry and biology using the designed activities. Upon successful completion of the project, the team aims to expand this work by developing a longer-term project in which specifically designed curricular materials and supports for three-dimensional teaching and learning are provided for larger groups of students. Over a longer time-scale, the researchers hope to build new collaborations that would support designing activities and curricular materials for different combinations of courses, such as chemistry and mathematics or biology and physics. Dr Rebecca Matz is an Academic Specialist in the Hub for Innovation in Learning and Technology at Michigan State University. Dr Matz completed her BS in Chemistry at University of Illinois before moving to University of Michigan to complete a PhD in Chemistry and MS in Educational Studies. Dr Matz’s research interests lie broadly in assessment and organisational change within STEM. Her work explores the levers and barriers to institutional reform and adoption of new teaching practices, assessment of curricular changes in early mathematics courses, and challenges in making connections across subject areas. In particular, Dr Matz’s current work aims to design activities that give undergraduate students the opportunity to use their knowledge of chemistry to explain biological phenomena. 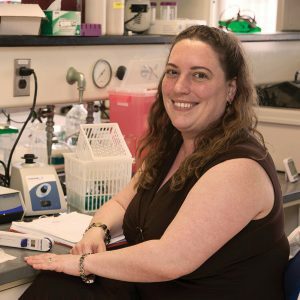 Dr Sonia Underwood is an Assistant Professor in the Department of Chemistry & Biochemistry and the STEM Transformation Institute at Florida International University (FIU). Dr Underwood joined FIU in 2016 after working as a Research Associate at Michigan State University in chemistry education research. Prior to that, she earned her PhD in Chemistry from Clemson University. Dr Underwood’s research interests are focused on developing assessment measures to determine the impact of curriculum transformations, investigating how students use a chemical structure to predict a compound’s macroscopic properties, and exploring the connections students make between their chemistry, biology, and physics courses. 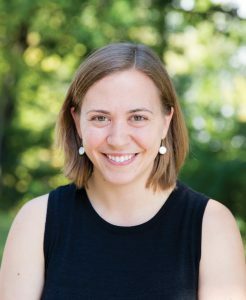 Dr Kristin Parent is an Assistant Professor who joined Michigan State University’s Department of Biochemistry and Molecular Biology in 2013. Dr Parent’s research focuses on understanding viral entry into host cells, and she uses cryo-electron microscopy to visualise the macromolecular structure of viral machines. Through this research we now better understand how viruses find, attach to, and infect specific hosts. In addition, her research has shed light on viral diversity in the environment. 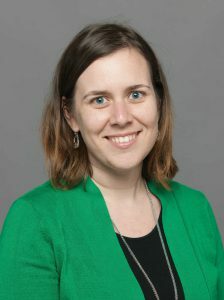 Dr Parent has won several awards and grants for both her research and teaching, including the MSU Outstanding Mentor and Teacher-Scholar Awards, and an NSF CAREER award for her work on virus host interaction and involving undergraduate, high-school and middle-school students in scientific research.